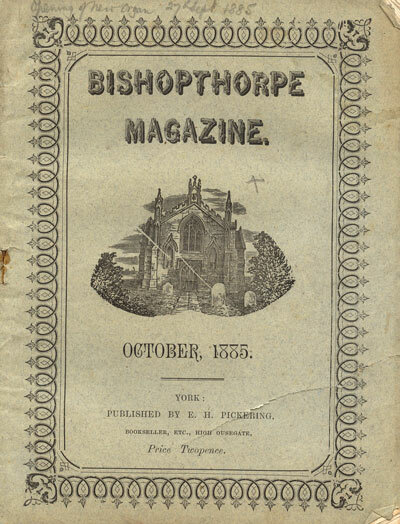 Since the founding of Bishopthorpe Local History Group in 1998, individuals and organisations have given or loaned the Group collections of documents and/or photographs. Following the refurbishment of the Village Hall in 2005, the Hall Committee generously gave a room in which to store the Archive. Since then, members of the Group have been cataloguing the collections. Loaned items are photocopied or digitised while original collections are stored in archive-quality boxes or sleeves. These are expensive so donations are always welcome and gratefully received. 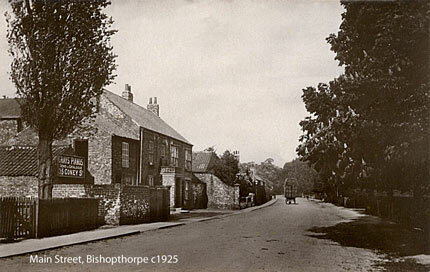 As well as the archive collections, there are searchable listings and transcriptions of the Bishopthorpe entries in Trade Directories (1823 – 1900); 19th and 20th century newspapers; and digital copies of The Valuation Office Survey, 1910 – 1915, which provide descriptions of every building in the village at that time. There follows a brief alphabetical listing arranged by subject with coverage dates. This list is not comprehensive and will be added to as material is catalogued. 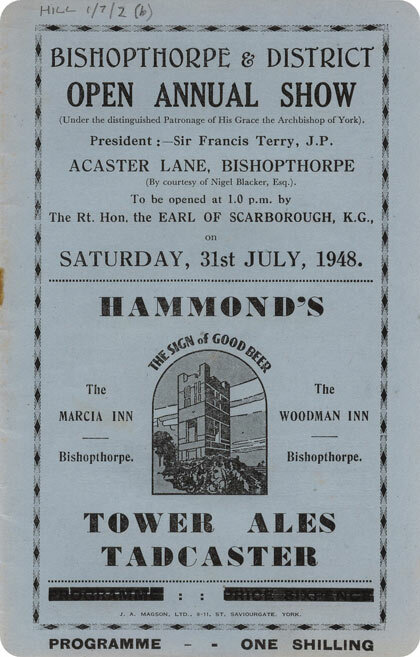 The Bishopthorpe Play (later Pageant): Programmes and photographs, 1928, 1930, 1954, 1956, 1965, 1970, 2000. 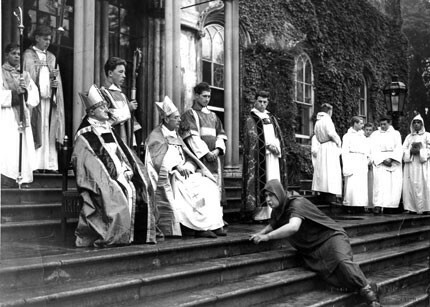 Bishopthorpe Pageant on the steps of the Palace in July 1954. Courtesy Northern Echo. 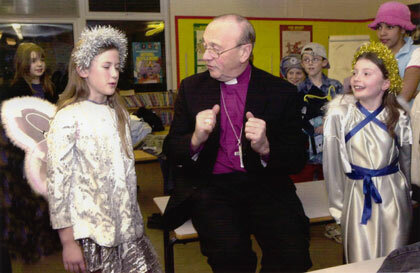 Archbishop Hope’s visit to the school to watch the Nativity, 2004. Courtesy The Yorkshire Evening Press. 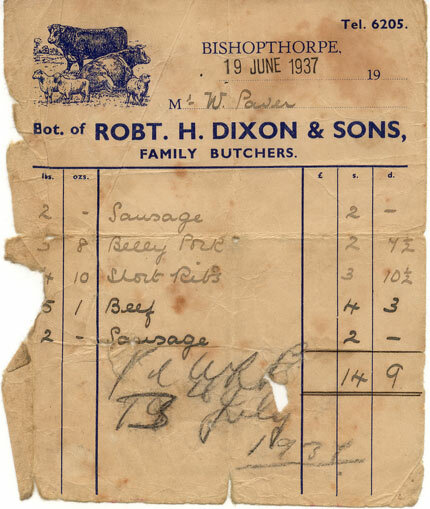 Butcher Robert Dixon’s weekly bill for Mrs. W. Paver in 1937. 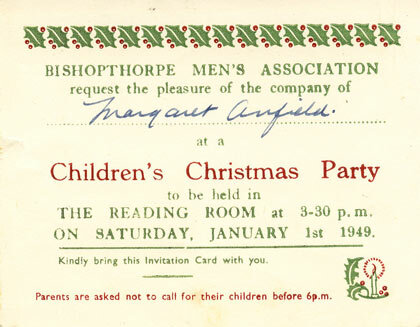 Margaret Anfield’s 1949 Christmas party invitation. Photographs: contact prints of the construction of the path. Photocopies of a number of Bishopthorpe properties. 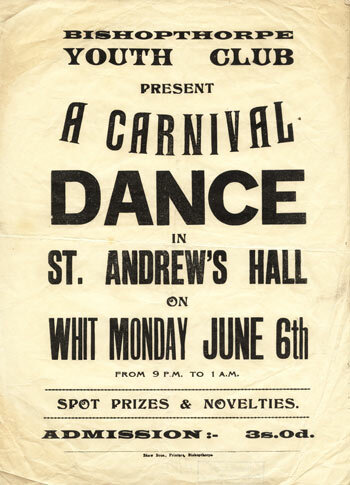 Programme for the 1948 Bishopthorpe Open Annual Show. See also Saint Andrew’s Church. See: Parish Council, Bishopthorpe Rural District Council, Tadcaster Rural District Council, West Riding County Council, Ward Newsletters. Admission out Court: George Spanton by will to Ann Spanton, 1845; Deed of Covenant: George Croft to James Croft (1872); lists of pains (1909); will of Thomas Stead (1852); bailiff’s authorisation (1909). 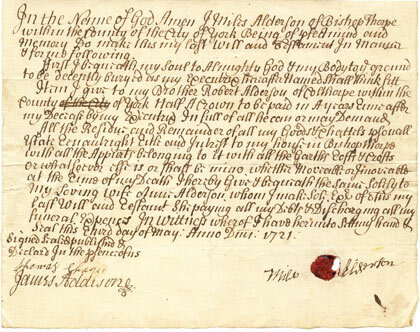 Miles Alderson’s original will, dated 3 May 1721. Family Bible: a large family bible containing information on the Osborn family. Recorded inscriptions from the headstones in St. Andrew’s Churchyard. Chronological listing of Bishopthorpe entries in 19th, 20th and 21st century newspapers. Corresponding print-outs or new cuttings. Ongoing. 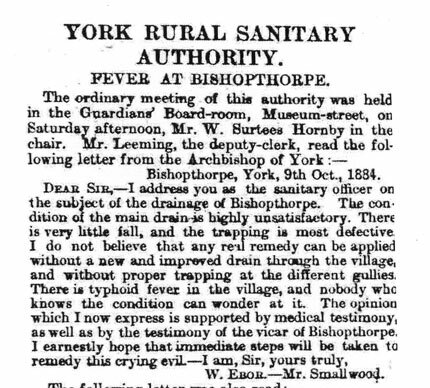 An article in the York Herald, Tuesday, 21 October 1884, p7. More than 60 interviews held with residents and former residents. 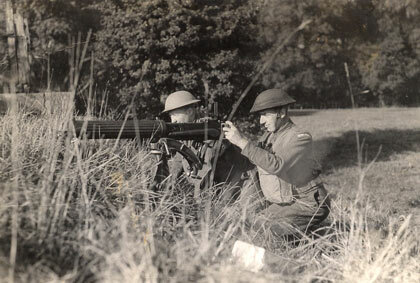 Transcriptions available. Election leaflets, poll cards, Labour & Conservative candidates’ election communications, correspondence, news cuttings, Register of Electors communicationS. 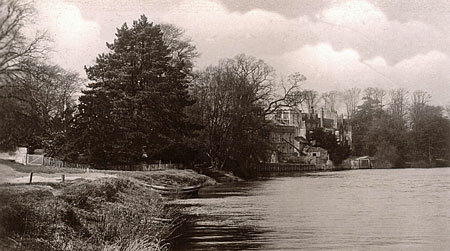 Numerous photographs of Bishopthorpe people, events, buildings and scenes. The Palace from the river Ouse. 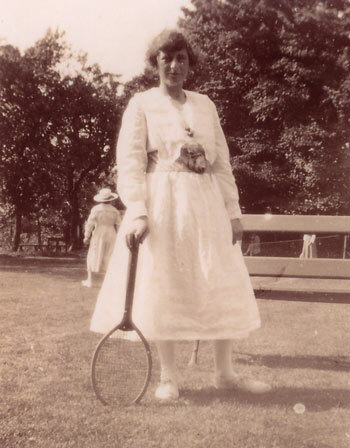 What the best-dressed lady tennis players were wearing c1912. This was taken in the grounds behind The Marcia. See: Conservative Associations; Parliamentary Elections. 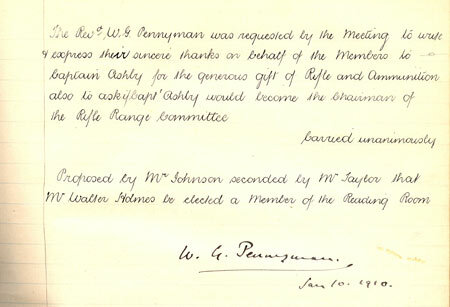 The Reading Room minute book in 1910 which reveals that one of the leisure activities of the all-male membership was the use of a rifle. 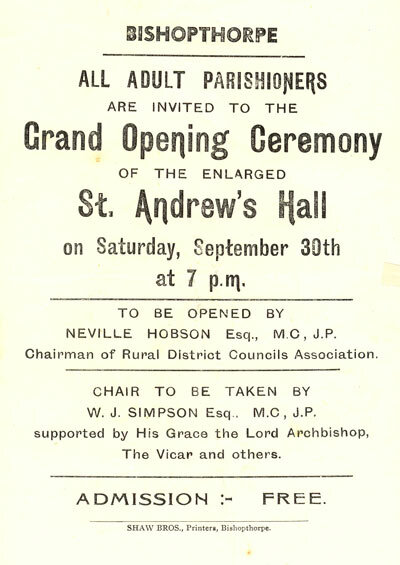 A flyer announcing the opening of St. Andrew’s Hall (Village Hall) following refurbishment in 1950. Notices, news cuttings, orders of service and leaflets for various functions including raising funds for electric lighting in church. 1917 – present. See also Ainsty Deanery Magazine; Parish Magazines; Link; Monumental Inscriptions. 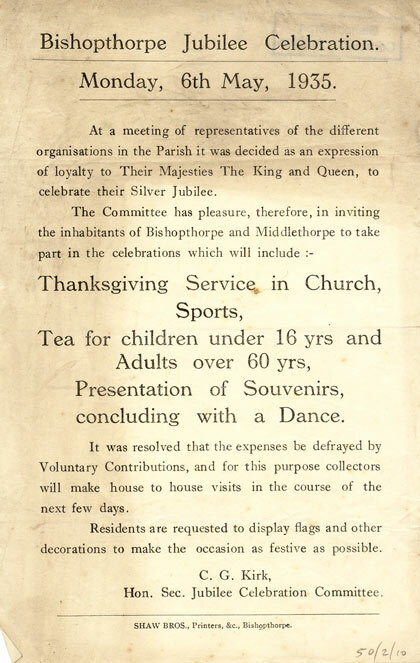 Bishopthorpe Group Committee Financial Statements, pamphlets, etc. Photographs. See also: Tennis Club, Women’s Institute, Youth Club. Bishopthorpe Sports & Leisure Management Committee: Minutes and Accounts. Photocopies of Bishopthorpe entries in Trade Directories and York City Year Books. Digitised pages from the field books for Bishopthorpe, (and corresponding plan), giving detailed descriptions of every building in the village within the above period. Programmes, printed notices, membership cards, correspondence. Photographs. 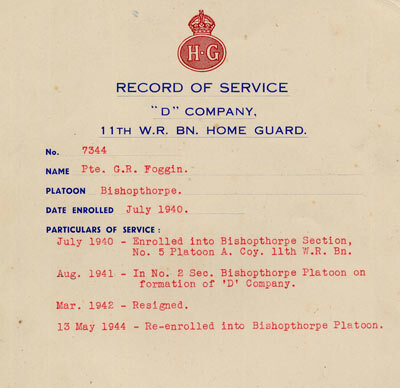 Reg Foggin’s Home Guard Record of Service, 1940 – 1944. See also Saint Andrew’s Church. 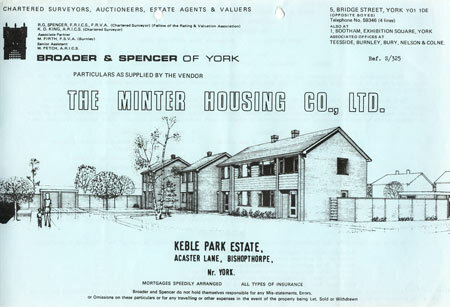 This Society rented the garden at the rear of The Poplars, Main Street, Bishopthorpe, (now Bishopthorpe Social Club) in order to run a miniature railway. The Society operated the railway there between 1949 and 1966. Members filmed the railway and have since digitised the cine footage taken during that period. Three DVDs have been donated to the Archive.